The exhibition catalogue Louise Bourgeois. 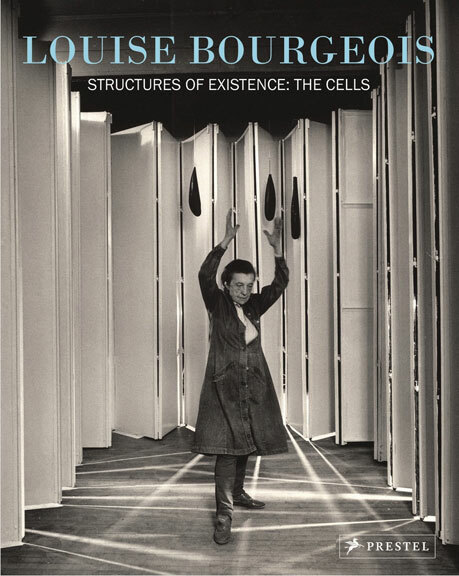 Structures of Existence: The Cells (Prestel Publishing and Haus der Kunst, 2015) showcases the artist’s work creating Cells, a series of architectural sculptures that she worked on for twenty years, from 1986 through 2008. These embody the belief of Bourgeois (1911–2010) that “space does not exist, it is just a metaphor for the structure of our existences.” The Cells are enclosures or cage forms, often incorporating mirrors, dummy-like figures, or staircases leading nowhere—nuanced and provocative spatial metaphors for her own personal history. The book compiles essays and conversations revealing Bourgeois’s influences and the way that her childhood experiences, coupled with recondite concepts from her early works, form the Cells series. The book’s sections provide a comprehensive perspective on how Bourgeois’s life and memories influenced the Cells. Texts include conversations with Bourgeois’s long-time assistant Jerry Gorovoy, essays by renowned scholars, a short biography, and selected statements and quotations from the artist herself. 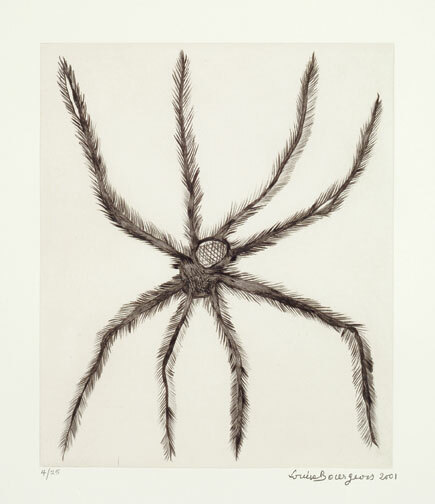 Currently on view at NMWA in Super Natural, Louise Bourgeois’s drypoint print Hairy Spider depicts a spider, a common motif in the artist’s work. Bourgeois associated spiders with patience, and she often likened them to her mother, whom she saw as patient to a fault when it came to handling her father’s adultery with her live-in nanny. To capture her mother’s presence in painful memories from her childhood, Bourgeois included spiders in some of the Cells featured in the exhibition catalogue—the book reveals that Bourgeois often felt frustrated that her patient mother calmly tolerated this infidelity. The drypoint in Super Natural connects back to Bourgeois’s oft-revisited themes of spiders, patience, and motherhood. This entry was posted in Book Review and tagged Louise Bourgeois, Louise Bourgeois. Structures of Existence: The Cells, Passage Dangereux, super natural, woman artist, women and nature by Women in the arts. Bookmark the permalink. I am happy to find your blog. I am very interested in Women’s Art History and I am glad I found the website for NMWA. I just did a post on some forgotten women artists who are still living. Thanks so much, Deborah! We’re glad you found us.